Inferior Alveolar Nerve Block (IANB) is a technique for dental anesthesia used to produce anesthesia of the mandibular teeth, gingival tissues of the mandible and the lower lip. One injection provides a wide area of anesthesia (useful for quadrant dentistry). Using an electrical pulp tester (EPT) and eliciting no response to maximal output (80/80) on two consecutive tests at least 2 minutes apart serves as a “guarantee” of successful pulpal anesthesia in nonpulpitic teeth. No pain is felt during dental therapy. Do not deposit local anesthetic if bone is not contacted. 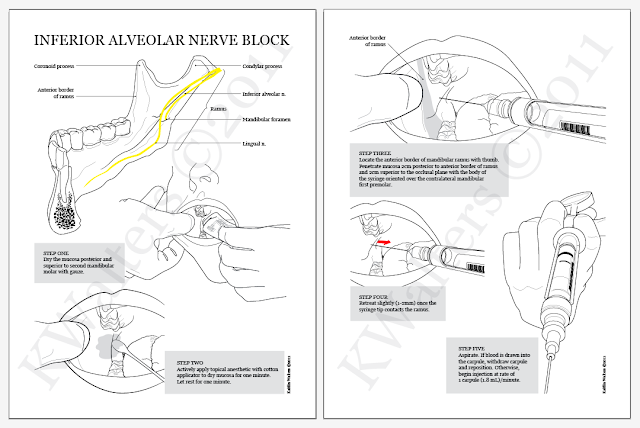 The needle tip may be resting within the parotid gland near the facial nerve (cranial nerve VII), and a transient blockade (paralysis) of the facial nerve may develop if local anesthetic solution is deposited. Avoid pain by not contacting bone too forcefully. Best IA Block video I've ever seen! !